Mac's Discus - 30 Years of Discus Breeding Experience! Over 30 Years Discus Breeding and Hatchery Experience! Mac’s Discus has been breeding and supplying quality discus fish to wholesalers, retail stores, and hobbyists world wide since 1985 and has been keeping discus as a hobby since the late 1970’s. Back then, the only discus available to hobbyists were wild caught and with little information available about their care, the learning curve was slow. With 30 years of collecting discus from around the world, we have the largest selection of colors and patterns to choose from. That experience also allows us to know the best possible health practices, so we can ensure the arrival of beautiful and healthy fish. Shipping discus fish can be difficult for the ill prepared, however we have developed and are the pioneers of reliable, safe, and affordable door-to-door delivery. 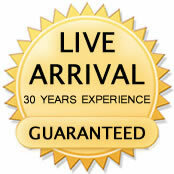 With a 100 percent survival rate when delivered on the scheduled delivery date, we have no problem offering our live delivery guarantee. There has been an explosion of new color varieties introduced since the mid 1990’s. We have risen to the challenge of possessing all kinds of discus and making them available to our customers for many more years to come.